Over 1.7 million Australians locked out of rooftop solar! As electricity prices have risen by 60-90 per cent above inflation, so have solar costs dropped, allowing home owners to use their roofs to harvest cheap renewable energy, and cut their dependence on the grid. But the problem of how to extend these benefits to renters and residents of apartment buildings and other shared accommodation – who have no roof on which to put PV panels – remains a barrier to true solar democracy. 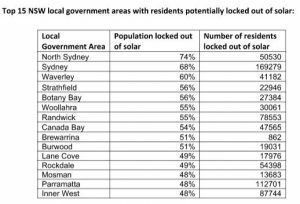 According to data from the recent national Census, there are nine council areas in greater Sydney, alone, where more than half of residents are “locked out” of solar. And in North Sydney, almost three-quarters of residents can’t access solar because they are renters or live in apartment buildings. Of course, there are ways to get around this – and a growing number of companies are working to help people to do just that. 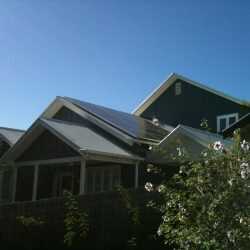 In June, for example, AGL flagged the roll-out of a new pilot scheme that will offer “virtual” rooftop solar to customers who rent, live in apartments or otherwise cannot install PV panels at their homes or businesses. At the time, AGL CEO Andy Vesey said the subscription-type scheme would, basically, build dedicated solar facilities for customers who can’t install their own solar, and give them – as a discount on their bill – the equivalent supply (to a rooftop system) from that solar. “So everyone will have access to solar, whether they have a roof or not; the same benefit. What’s the benefit of a solar system? It’s price stability. It’s certainty. One of the newest players on the solar access for all scene is Sydney-based start-up SunTenants. The company was founded by Bjorn Sturmberg, a solar researcher and project manager who is driven by the belief that everyone should have access to solar. Indeed, in 2016, he masterminded the installation of 30kW of rooftop solar and a 43.2kWh Enphase battery storage system at an eight-unit student housing co-operative in the Sydney suburb of Newtown – a first of its kind in Australia. Sturmberg says SunTenants’ business model works by paying landlords for every solar panel they install, and charges tenants a discounted rate for the solar power they use – generating attractive returns for landlords while saving tenants hundreds of dollars a year on their power bills. “SunTenants takes responsibility for the variability and maintenance of solar systems, which it manages using data analytics and our solar expertise,” Sturmberg told One Step by email. “In this way we guarantee the income for owners and the savings for tenants. The company also offers a “lowest price guarantee”, says Sturmberg, to ensure all tenants are better off with solar by matching or beat the tenants’ retail rate. “With electricity prices skyrocketing, SunTenants creates a desperately needed win-win for landlords and tenants,” he said. 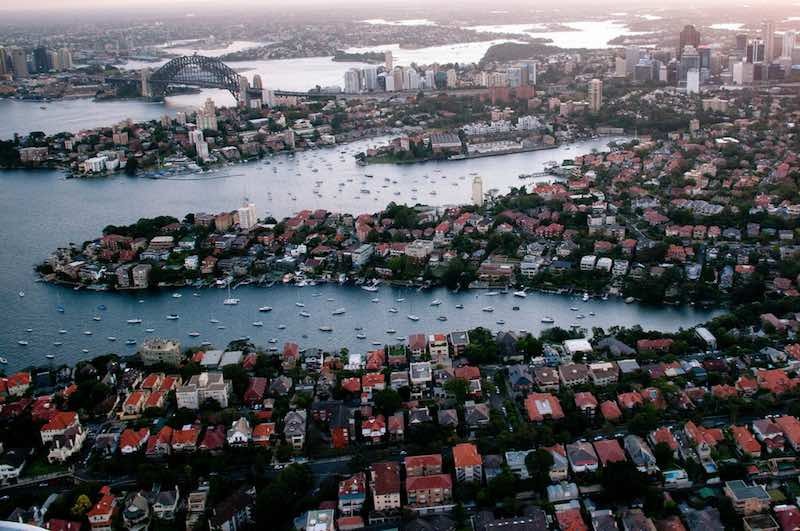 It’s an approach not unlike that of fellow Sydney company, Prepaid Solar, which arrived on the scene in 2015 to target the 1.8 million vacant rooftops estimated to belong to the residential rental market in Australia. Prepaid Solar, whose Prepaid Meter utility technology was already being used around Australia in sub-meter solar projects for bodies corporate, said back in 2015 that the local market had passed the tipping point where solar could make money for landlords, with discounts passed on to tenants. The technology allows property owners to take over the retail power bill and charge the tenants a discounted rate. 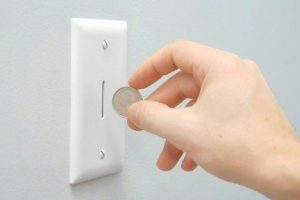 For tenants, the ability to monitor and manage their power usage offers the potential to save between 10-15 per cent on electricity through efficiency, once the meter is installed. It also offers the benefit of lower and more predictable power bills. 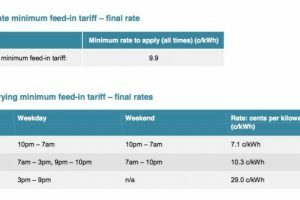 At the time, Prepaid Solar estimated returns for investors of above 20 per cent – or 40 per cent on some commercial sites – payback would occur quickly, leaving landlords with “free electricity” to sell to their tenants for the next 20 years. “This is a way for landlords to participate (in distributed solar power generation) and get the benefits and still be able to provide their tenants with cheaper power,” said Prepaid Solar managing director, Vincent Selleck, in an interview with RenewEconomy. Two years later, Community Power Agency founding director Nicky Ison says it is well and truly time all Australians had equal access to residential solar. “People are sick and tired of being at the mercy of the big power corporations,” Ison said in comments earlier this month. But there is hope. Ison says that as well as the efforts being made by the corporate sector, there are community groups around Australia coming up with novel ways of helping people of all incomes and circumstances access the many benefits of renewable energy and storage. Solar gardens – in which an individual buys a solar panel and puts it in a local ‘plot’ with others from which the electricity generated is credited onto their power bill – is just one example, she says. SunTenants, meanwhile, has just cleared its last regulatory barrier and is preparing to install its first solar systems in September. “Our approach to business is super collaborative and SunTenants solution is powered by strong partnerships with some of Australia’s leading energy companies,”Sturmberg told One Step. “We look forward to announcing the details of these partnerships and some exciting projects with the community housing in coming months,” he said.